The population of the Golan’s one town, Katzrin, is currently around 8,000. The combined population of the other smaller Israeli communities on the Golan Heights (not including the four Druze communities and the Alawite village of Ghajar, where the residents are also Israeli citizens) is around 17,600. 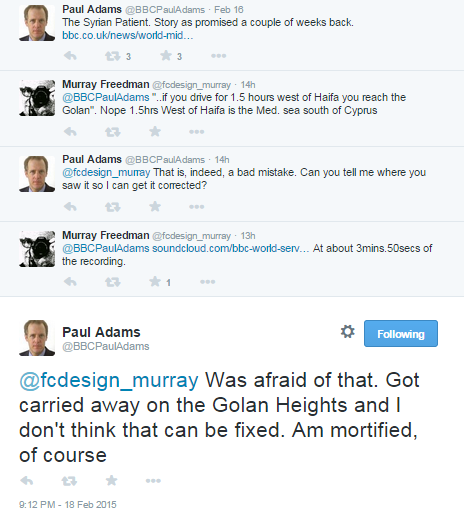 The total number of what Paul Adams terms “settlers” in the Golan Heights is therefore around 25,600 – i.e. more than double the number of people he claims “have moved there”. With nearly 52 years have passed since the Golan Heights came under Israeli control, a significant proportion of the people living in the region did not ‘move there’ at all but were born as second and third generation Golan Heights residents. Seeing as it is however highly unlikely that Paul Adams was seeking to differentiate between those who came to live in the Golan Heights after 1967 and those residing there since birth, we can conclude that Adams’ inaccurate claim of 12,000 “settlers” is once again the result of inadequate research. On Oct. 8th, the BBC published video segment by Paul Adams titled “After 70 years, who are the Palestinian refugees?”, filmed at the Burg Al-Barajneh “refugee” camp in Beirut, which focused on Palestinian fears that, under the new US peace plan, they’ll never be allowed to return “home”. Though the official UNRWA figure counts over 5 million Palestinian refugees, the overwhelming majority of these “refugees” – as we’ve noted repeatedly – are merely Palestinians descendants (children, grandchildren, great-grandchildren, etc.) of the original 711,000 actual refugees from 1948 who, unlike every other refugee population, are automatically granted refugee status, even those who have citizenship in other countries. As Einat Wilf, co-author of the book ‘The War of Return’ observed about the fiction that there are millions of Palestinian refugees. ….The remaining 20 per cent of the descendants…are inhabitants of Syria and Lebanon who are by law denied the right to citizenship granted to all other Syrians and Lebanese. The number of actual refugees from 1948 is believed to be closer to 20,000. As you saw in the clip, a Palestinian professor in Lebanon was interviewed who explained that Palestinian “refugees” in Lebanon – many of whom have lived in the country for generations – are truly second class citizens and are denied basic employment and property rights. Yet, note how Adams failed to draw the most intuitive conclusion from this fact: that the refugee issue – and the fact that so many Arabs of Palestinian descent identify as “refugees” – is perpetuated by Arab states (and UNRWA) who refuse to encourage the full integration of Palestinians into their countries. Nor, did Adams ask why such “refugee camps”, run by UNRWA, in Lebanon, Jordan, and within the Palestinian Authority have never been converted to ordinary cities. Adams’ other Palestinian interviewee – a young woman also several generations removed from the actual refugees of ’48 – insisted on her inalienable “right of return” to Israel. But, BBC viewers were not reminded that such descendants of refugees don’t in fact have such a legal right to “return”, and that Israel would of course never engage in an act of national self-immolation by allowing millions of Palestinians to become citizens of the state. Adams, in his final thoughts on the problem, opines that for such Palestinians, living in camps in Lebanon and Jordan, their refugee status is the only thing they possess. However, hope based on a right (of return) they don’t have, and on a future vision of life (in Israel) that will never be brought to fruition, is not a possession. It’s a handicap, and a cynical formula for perpetuating Palestinian victimhood that continues to be amplified and legitimized by media outlets like the BBC. Unsurprisingly, Donnison did not bother to inform listeners that what he described as protests by “demonstrators” were actually violent riots with some 8,000 participants that included a breach of the border fence as well as arson attacks and attacks with IEDs and petrol bombs. Neither did he bother to clarify that Israel disengaged from the Gaza Strip 13 years ago and in this context “Israel’s occupation” means Israel’s existence. Listeners were not told that Muadh al-Suri was photographed wrapped in a Hamas flag and headband at his funeral. As we see, Donnison yet again cited “United Nations” figures without clarifying to listeners that they are sourced from the same terror group which organises the ‘Great Return March’ agitprop and hence has a vested interest in amplifying casualty figures. The report by Paul Adams that Donnison was introducing is actually the same one that was aired on BBC Radio 4 on July 25th and which was discussed here. Many thanks to all those who wrote in to alert us to an item aired in the July 25th edition of the BBC Radio 4 programme ‘Today‘. That report by Paul Adams – currently a BBC diplomatic correspondent and formerly twice based in Jerusalem – was introduced by presenter Mishal Husain (from 0:47:15 here) with multiple inaccuracies. The restriction on fuel and gas imports was lifted at noon on July 24th after having been in force since July 17th: in other words for seven and a half days. Husain’s claim that fuel had entered the territory “for the first time in two weeks” is hence inaccurate. Listeners were not told that the restrictions were introduced not only after “incendiary kites were flown across the border” by parties Husain refrains from identifying but also after terror factions in the Gaza Strip had launched over 200 rockets and mortars at Israeli civilians two days beforehand. Husain: “The UN says the lack of fuel has affected Gaza’s only power plant and hospitals, where hundreds of Palestinians are still being treated after being shot by Israeli soldiers during the protests of recent weeks. With the background to the report having thus been framed as related to Israel’s counter-terrorism measures, Adams commenced by telling a two month-old story. Adams did not inform listeners that – as reported by some journalists at the time – Fathi Harb was “heard cursing the government” as he set himself on fire. Other media outlets noted that his family had been affected by the Palestinian Authority’s cutting of salaries to employees in the Gaza Strip. In Paul Adams’ account, however, there is no room for any mention whatsoever of Hamas or the Fatah dominated Palestinian Authority. After listeners had heard from one of those women, Adams went on, again studiously avoiding any mention of uncomfortable subjects such as Hamas’ use of water and sewage pipes to make rockets or Mahmoud Abbas’ deliberate exacerbation of the Gaza power crisis last year. Adams did not bother to ask whether those “haunted faces” might be linked to the fact that four years ago, children living in Beit Hanoun and Beit Lahia were witness to the firing of 69.4% of the 3,356 missiles fired at civilian targets in Israel by terrorists in the Gaza Strip between July 8th and August 5th 2014. As we see, Paul Adams managed to get through his entire report without mentioning the words Hamas and terrorism even once. Obviously such blatantly context-free reporting – along with Mishal Husain’s inaccurate claims -not only contributes nothing at all to the BBC’s public purpose of helping its audiences “engage fully with issues” but actively hinders that process. What do BBC audiences know about the background to tensions in northern Israel? With Israel braced for an anticipated attack by Iran and/or its proxies in the north, it is worth taking a look at how the BBC has to date covered the background to a story it may yet have to report. Listeners to BBC Radio 4 on April 15th were told that most of the people killed during that attack were “believed to be Iranians” but not that seven of them were members of the Iranian Revolutionary Guards Corps, including the head of its drone programme. Following that April 9th incident a series of threats against Israel were issued by various Iranian officials but those threats and the resulting increased tensions did not receive any BBC coverage. On April 30th the BBC News website reported further attacks on military installations (including what was described by other media outlets as a “depot for surface-to-surface missiles”) in Syria. Additional threats from Iranian officials followed that incident. “…the Israeli military and intelligence services had identified preliminary efforts by Iran in Syria to carry out its reprisal, using its IRGC (Islamic Revolutionary Guard Corps), the Hezbollah terrorist group and local Shiite militias to launch a barrage of precision-guided missiles, likely at Israeli military targets in the north. “Israel has recently identified with certainty Iranian preparations to fire at the north,” Channel 10 said. “We are not on the eve of war with Iran… but Iran is very determined to carry out an attack” to avenge the T-4 strike and the deaths of its military personnel, it said. On May 7th visitors to the BBC News website saw the first generalised mention of Iran’s threats against Israel in a report titled “Israel minister threatens Assad over Iranian attacks from Syria” –which promoted superfluous qualification of Iran’s military build-up in Syria. “His comments came amid reports that Israeli authorities were preparing for missile strikes by Iran or its proxies. Iran has vowed to avenge recent air strikes on its military facilities in Syria that were attributed to Israel. Additional threats by Iran’s chief of staff on the same day did not receive any BBC coverage. On May 8th the BBC News website published a report originally headlined “Israel Golan Heights alert over Iran ‘irregular activity’ in Syria”. The report was later retitled “Syria blames Israel for air strike near Damascus” and – despite having got it right earlier – the BBC managed to inaccurately describe the location of the “irregular Iranian activity”. “Syrian state media says Israel has launched an air strike against an army position south of the capital Damascus. A commander supporting President Bashar al-Assad told Reuters news agency that the strike had targeted a Syrian army position. The Syrian Observatory for Human Rights, a UK-based monitoring group, said the target was an arms depot. Other media outlets quoted the same source cited by the BBC as specifically saying that the site (which last November was mentioned in a BBC report about Iran’s establishment of military bases in Syria and last December was also described in a BBC report as “an arms depot”) was an “arms depot belonging to Hezbollah and the Iranians” while at least one Israeli media outlet described it as a storage facility for Iranian missiles rather than “a Syrian army position” as touted by the BBC. Although Iran has been repeatedly threatening to attack Israel for the past month, the few headlines seen by BBC audiences in relation to that story have focused on Israel: “Israel minister threatens Assad over Iranian attacks from Syria” and “Syria blames Israel for air strike near Damascus”. Obviously BBC audiences have not been provided with the full range of information necessary for proper understanding of this still ongoing story. On June 9th an article by the BBC’s diplomatic correspondent Paul Adams was published in the ‘features’ section of the BBC News website’s Middle East page under the title “Six Day War: Six ways the conflict still matters“. Like other items included in the BBC’s coverage of the 50th anniversary of that war, the main – but inaccurate – message behind Adams’ article is that the modern-day conflict has its roots in that week in June 1967. Adams lays out six ways in which, according to him, that war “left its mark”. His first section is titled “Occupation of the West Bank and Gaza”. Obviously that heading misleads readers by implying that the Gaza Strip is still under ‘occupation’ even though Israel withdrew entirely from the territory nearly 12 years ago. Obviously any mention of the fact that both the Gaza Strip and Judea & Samaria were part of the territory allocated by the League for the establishment of a Jewish homeland would detract from Adams’ inaccurate portrayal of Israelis living in Judea & Samaria as a monochrome group of people motivated solely by religion. He closes that section by tapping into a well-worn – but inaccurate – BBC theme: the erroneous notion that ‘settlements’ are the prime factor preventing resolution of the Arab-Israeli conflict. The fourth section of Adams’ article is titled “Peace with Egypt/Jordan” and in it readers find a rare reference to the Khartoum Resolutions – albeit with implication of Israeli blame. Adams tells readers that following the peace agreement with Israel, “Arab leaders […] turned their backs” on Sadat. In fact, they expelled Egypt from the OIC and the Arab League and all but three Arab League countries suspended diplomatic relations with Cairo. Section five of the article is headed “Peace process” and there readers are steered towards the view that the issues to be resolved in that process originate from the Six Day War. The all-important refusal of various parties to accept the existence of the Jewish state that was already in evidence half a century before the Six Day War is not of course listed among Adams’ “stumbling blocks”. Adams’ final section is titled “Golan Heights” and his portrayal of the events of 1967 excludes any mention the relevant topic of years of Syrian attacks on Israeli communities below the Golan. Adams also misleads with regard to the armistice lines prior to the Six Day War. In fact, the talks failed because Assad senior demanded access to the Sea of Galilee that Syria had never previously had as well as ‘shared sovereignty’ over the lake. Like the other recent Six Day War features by Tom Bateman and Jeremy Bowen, this article by Paul Adams is essentially an exercise in advancing a transparent political narrative according to which the modern-day conflict is exclusively rooted in the outcome of those six days in June 1967 – especially the ‘occupation’ and ‘settlements’. And like those other two articles, Adams’ advancement of that narrative does not serve the purpose of enhancing audience understanding of either the root causes of that war, the ones that preceded and followed it or the continued lack of progress in resolving the century-long conflict. One might have assumed that events in the Middle East over the past six years would have brought the BBC to the understanding that a solution to the Arab-Israeli conflict is not the panacea to all that region’s problems. As has been the case in previous BBC reporting both on that UNSC resolution and on the topic in general, that choice of terminology obviously leads BBC audiences to mistakenly believe that Israel is constructing new communities rather than – as is actually the case – building homes in existing neighbourhoods, towns and villages. Listeners to that news bulletin later heard from the BBC’s diplomatic correspondent Paul Adams who managed to make both the Palestinian Authority and the Hamas regime in the Gaza Strip disappear from the story. The Palestinian Authority governed the Gaza Strip after Israel’s disengagement in 2005 and it has been governed by the Hamas regime since its violent take-over of the territory two years later. The vast majority of Palestinians in Judea & Samaria live in Areas A and B and have been governed by the Palestinian Authority for over two decades. The number of Palestinians living in Area C (which, under the terms of the Oslo Accords is under Israeli control) and in Jerusalem does not even approach the one million mark. Paul Adams’ rhetoric obviously fails to help BBC audiences to come any closer to understanding this particular “international issue”. One member of the public who obviously noted the same point took to Twitter to inform Adams of his geographical error. However, Paul Adams did manage to edit the report to cut out the word ‘west’ from the recording and thus correct the error. It is refreshing to see a BBC journalist responding so quickly to a member of the public and making effective efforts to correct an obviously genuine mistake. On February 16th the BBC broadcast and published several reports by Paul Adams on various platforms – all of them telling the story of a Syrian man who received medical treatment in one of Israel’s hospitals. 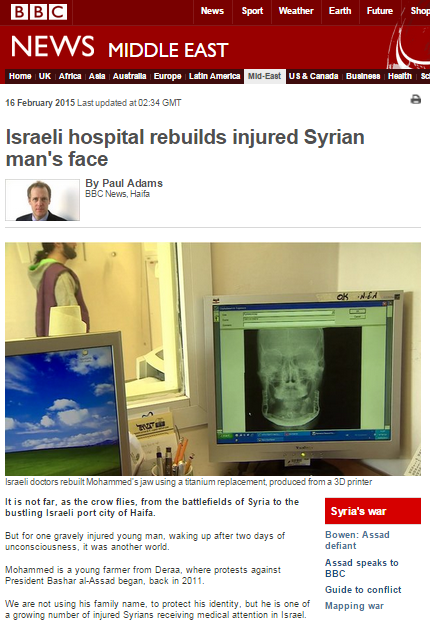 On the BBC News website’s Middle East page readers found a report titled “Israeli hospital rebuilds injured Syrian man’s face“. On the same page a filmed report – also broadcast on television news programmes – appeared under the headline “Syria war victim given new jaw in Israel” and two additional filmed reports (here and here) were also available. An item on the same topic appeared in the BBC World Service radio programme ‘Newshour’ (from 17:38 here) and a version of that audio report was also promoted separately on Twitter. In fact, whilst the uprising in Syria began in March 2011, it was only almost two years later – at the beginning of 2013 – that the first of the wounded arrived on the Israeli-Syrian border. 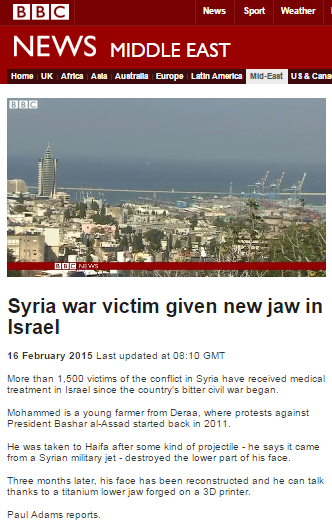 Since then, thousands of Syrians have been treated in Israel – although the BBC’s coverage of the topic has been sparse (see related articles below) and these are the first reports on the subject since November 2013. That makes it all the more unfortunate that Adams’ extensive reporting did not also inform audiences about other aspects of the story such as the existence of an IDF field hospital in the Golan Heights and the fact that the cost of the treatment for thousands of Syrians there and in civilian hospitals (over 33 million shekels the latter establishments alone as of October 2014) is borne by the Israeli tax-payer. Adams’ reports all inform audiences that his interviewee was scared when he found himself in Israel and that for all the Syrian patients arriving in Israel “it’s a journey into the unknown”. He does not, however, approach the topic of the Syrian state-sponsored propaganda which was the root cause of their views of Israel before they saw it for themselves. Of course if you drive about an hour and a half west from Haifa (or even a lot less), you’ll actually end up in the Mediterranean Sea: the Golan Heights are to the east/north-east of Haifa. On February 13th the BBC’s world affairs correspondent Paul Adams sent this Tweet to over ten thousand followers. 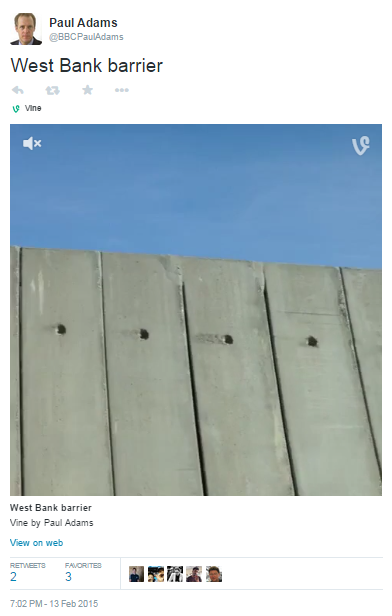 As readers can see for themselves, the video purporting to show the “West Bank barrier” is in fact a loop of the same footage shown over and over again in which the same graffiti appears repeatedly every few seconds. Over 90% of the anti-terrorist fence is exactly that: a fence constructed from wire mesh. Only a small proportion is constructed from concrete slabs of the type shown in Adams’ manipulated video. Those familiar with the reports produced by Paul Adams when he was ‘parachuted’ into the Gaza Strip during last summer’s conflict will not be very surprised by this inaccurate, misleading and context-free representation of the anti-terrorist fence. Apparently a previous Twitter gaffe by Adams in which he hastily promoted inaccurate information to his followers, leading them to believe that the son of a BBC employee in the Gaza Strip had been killed in an Israeli airstrike, did not prompt him to refresh his knowledge of BBC guidelines on the use of social media. The BBC’s reputation for integrity and impartiality is not strengthened when, apropos of nothing, a BBC correspondent decides to upload to his Twitter account intentionally edited video footage bereft of any context and misrepresenting a politically contentious issue.